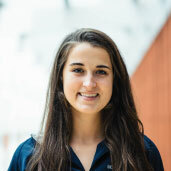 Emily is a junior in LSA double-majoring in Organizational Studies and Psychology and double minoring in Business and Sociocultural Anthropology. Her main area of interest lies at the intersection of these disciplines—how people interact intra and interpersonally within organizations, how positive organizations are built socially and financially, and cross-cultural comparisons of organizational structure. She is particularly excited about the unique lens that Positive Organizational Scholarship provides for answering these questions. Emily is pursuing a career in partnering with organizations to maximize their organizational effectiveness amidst rapid change and innovation. She hopes to take the skills that she gains through +Lab to aid organizations in leveraging their Human Resources function and their assets of leaderships and culture to flourish in the constantly changing business landscape. Outside of the classroom Emily can be found eating too much Hershey’s cookies & cream chocolate, playing basketball, buying another pair of sweatpants, or reading Food Network Magazine.